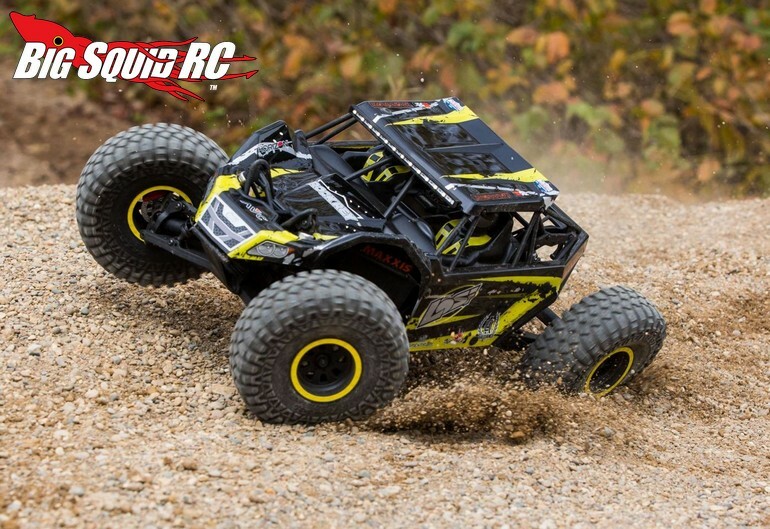 Everybody’s Scalin’ – Enter the Rock Rey « Big Squid RC – RC Car and Truck News, Reviews, Videos, and More! So much for the end of the year having a slow news cycle, eh? Out of nowhere, Team Losi has announced the Rock Rey RTR Rock Racer (say that 5 times fast!). It has a Yeti style solid rear/ IFS front setup with more of an RR10 Bomber style and stance. As far as looks go, they knocked this one out of the park. If there is a better looking rock racer on the market then I haven’t seen it. I dig the colored bead rings, shock hoops that go through the hood, cosmetic brake rotors and great looking proportions (a bit exaggerated but I’m cool with that). And hey, a functional light bar! Always a nice touch. It looks fast sitting still. All the other details sound good- brushless out of the box (albeit sensorless), heavy duty gears, aluminum chassis plate to avoid flexing, etc. Something very important that the press release is lacking though- what’s up with the diffs? Are they locked or open? While not a deal breaker either way(it’s relatively simple to change out diff gears), that’ll definitely influence the capabilities out of the box. Open diffs mean it’ll be more of a speed demon/basher in stock config. Locked diffs mean it won’t handle as well but will be able to take on the rocks. It could also be a locked rear, open front like the aforementioned Yeti. Hopefully the axles are locked from the get-go. If so, the Rey looks to be a true rock racing vehicle right out of the box. In watching the promo video I don’t see any diff unloading, so that suggests it’s setup that way. We’ll work on getting that clarified shortly. When it comes to rock racing, durability is going to be key. Unless there is a segment of the hobby that’s in to demolition derby aircraft (hey, anything is possible these days) rock racing is by far the toughest test a vehicle will ever face. It’s a mix of high speed running and crashing into rocks with locked-up drive trains that have little to no slippage. Horizon has been on a tear lately and seems very intent on capturing more market share in the scale crawling arena. The Rock Rey would make for a nice “second fist”, if you will, to compliment their popular Ascender line in a one, two punch combo to take on the current big name in r/c crawling. The truck is scheduled to release in February so hopefully we can get our hands on one before then. Look for more on the Rey as soon as we do. 2017 looks to be off to a great start!